Nikka Super “Revival” Limited is a romantic story of love and spirit across time and space. Masataka Taketsuru was the son of a Sake producer. As a young man he was sent to Scotland to learn the secrets of Whisky. He did… but he also learned about love. He met Rita Cowen — a Scottish lass whom he married and took back to Japan with him. In 1934, he founded Yoichi Distillery in southern Hokkaido on a spot surrounded on three sides by mountains — a terrain and climate very similar to the Scottish Highlands. Yoichi has its own cooperage and makes its casks on-site using new oak, producing big, oily Whiskies in the Highland style. Taketsuru became Japan’s first master distiller. But in 1961, Rita passed away. He knew that the only way to demonstrate his affection was to make a masterpiece of Whisky in her honor — choosing the oldest and finest single-malt spirits to blend the Limited Edition Super Nikka. The current masters at Nikka decided to do it all again. They tested one of the rare surviving 1962 Super Nikka bottles from a private collection. Then they aged and blended and tested until they got it just right. The result is Nikka Super “Revival” Limited. What does Nikka Super Revival Limited taste like? The Flavor Spiral™ shows the most common flavors that you'll taste in Nikka Super Revival Limited and gives you a chance to have a taste of it before actually tasting it. Whisky or Whiskey? The spelling differs geographically. In Scotland, Japan and some other parts of the world distilleries usually spell it Whisky; in Ireland and USA they spell it Whiskey. 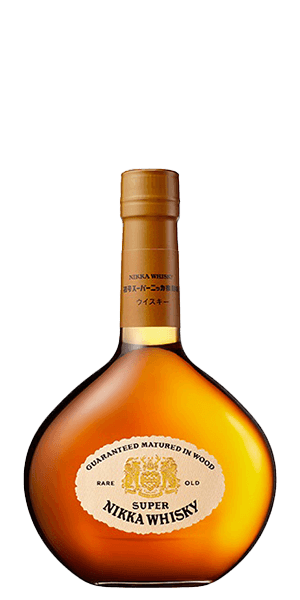 The original Limited Edition Super Nikka was released in 1962. Rare full bottles still occasionally come up for auction, fetching thousands of dollars each. Well. A bit plain, narrow taste. And a short one. At least in comparison to Nikka standards. We'd Like You to Meet Japanese Whisky. You're Going to Love it. Japanese Whisky: Did the Apprentice Surpass the Master?